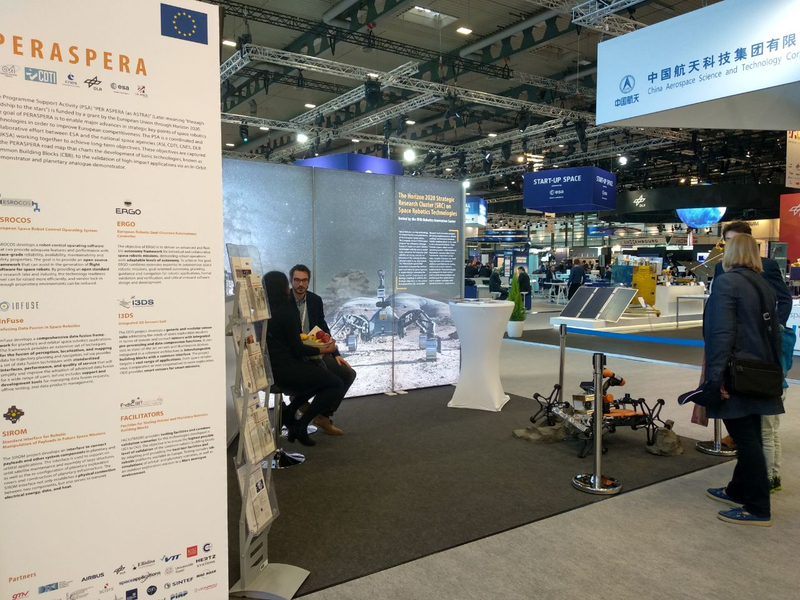 OG1 was present at The Horizon 2020 Strategic Research Cluster (SRC) on Space Robotics Technologies booth (5 A 61 in the Exhibition Hall) of the Bremen Exhibition & Conference Center at the International Astronautical Congress IAC in Bremen from 1st to 5th October 2018. IAC conference was a great opportunity to share the latest insights and experiences on Robotics within PERASPERA programme and a perfect marketplace to discuss projects and plans within an interdisciplinary framework. The IAC is the one time of the year when all space actors come together. Global, multidisciplinary and covering all space sectors and topics, it offers everyone the latest space information, developments but above all contacts and potential partnerships. More than 4500 experts from industry, research and space agencies will meet than ever before at. Around 6200 participants are expected to attend and take part in the programme that includes over 2,000 lectures. At this year’s particularly large trade exhibition, around 140 organisations, associations and companies will be presenting their activities to the international audience, who have travelled to Bremen from more than 60 countries.